Stephen Harper’s recent political fortunes have been mediocre at best. Not only have his attempts to portray his chief opponent Liberal leader Justin Trudeau as a flamboyant man with no experience or judgement to lead a country, his track record is taking fire from all ends. On the front of accountability, the man who was supposed to clean up government in 2006 may have a bigger mess on his hands. With entitlement plaguing the senate and his former right-hand man writing a cheque for embattled star senator Mike Duffy, The Duffy Affair has put Harper’s own judgement under a microscope. Add rampant infractions to electoral law, starting with in-and-out in 2006, evolving more recently to the robocall scandal which remains under investigation but has already charged former tory staffer Michael Sona, and electoral misconduct leaving former Parliamentary Secretary Dean Del Mastro facing criminal charges, and one can say Harper has had a tough year to say the least. On the front of freedom, one must wonder what Harper would have said in 1997 about a government that allows police to search the phones of people they arrest – even the falsely accused – given “adequate reason” – which we all know can easily be abused and turned into an abrupt violation of privacy. Add to this the fact that the same legislation has had three titles since its creation. The Protecting Children from Internet Predators Act, Protecting Canadians from Online Crime Act, and the Protection of Canada from Terrorists Act are all underlying attacks on individual privacy and freedom. Each of these bills attempt to give law enforcement the power to monitor individuals’ conversations and metadata and arrest said people without a warrant based on something said individuals posted online. For a government that celebrates the dismantling of the long gun registry on the basis of releasing infringed upon individual liberties, it sure is strange that surveillance is the method of choice for each of these pieces of legislation. On the front of economic management, Canada’s economy is still sluggish,the jobs market is lackluster and the Conservatives are finally moving past the deficit they created – even though Harper promised there wouldn’t be one. In 2015, a surplus will look nice on Harper’s campaign trail, but it will be the first one he’s created in nine years. Compared to the consecutive years of double-digit surpluses and debt repayment under Paul Martin and Jean Chretien, Harper is an amature – not to mention the debt repayment done in the ’90s by the Liberals was destroyed by the Harper government that dug Canada into a new record of national debt. 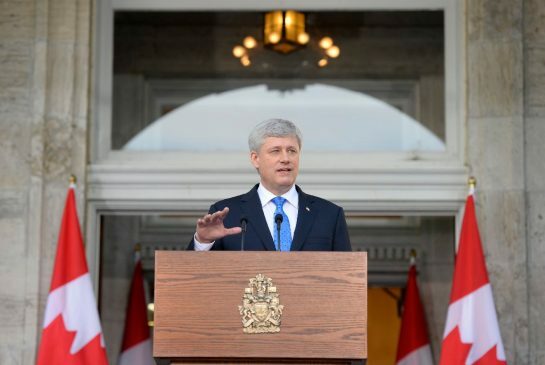 It would appear that on three major fronts, Harper has some contradictions to explain. The reality is, the Harper Canadians saw in 2006 wasn’t the actual Harper, nor is the one today in fact. In his own words, Harper has admitted Conservatives have a bad record in fiscal management, despite using fiscal prudence as the campaign starter in 2008 and 2011 respectively. 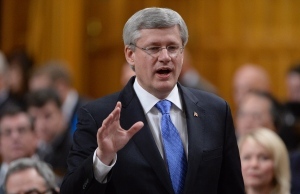 The reality is, Harper owes his political success, ironically enough, to the Liberal Party of Canada. It’s leftward veer in 2008, and further, in 2011, left centrist voters with no other option than the Conservative Party, translating into increased winning margins and what will be a nine-year legacy by 2015. In 2011, Canadians had a choice between the NDP, a watered-down version of the NDP and the Conservatives. The reality is, the Conservatives didn’t win 2011, the left lost. But even more so, the centrists and moderates that voted Conservative to avoid a Liberal-NDP coalition and to avoid reckless and unnecessary new spending programs didn’t vote for a centrist leader. Some swallowed their tongue and accepted that Harper would be more Conservative than their usual likes, others had no idea what they actually voted for – an even larger amount became disenfranchised and gave up on voting. In his own words, Harper, in 1997, admitted the party he co-created, the Reform Party, that he lead to the merger with the old Progressive Conservatives to create the new Conservative Party we know today, is indeed Canada’s version of the radicalized Republican Party of the United States, one most Canadians would never identify with in terms of values, yet in 2008, Harper told his victory crowd that Conservative values were Canadian values. The Liberal Party, under Justin Trudeau is now veering back to the centre, where most of Harper’s votes came from. As Mulcair and the NDP also approach the centre, to the dismay of many of it’s left-wing die-hards, 2015 is painting itself to be an interesting picture of how Canada might diverge, ironically, as the major parties move toward convergence. The past is an indicator of the future, be it direct, or indirect. The next election may look familiar to those that were around in 2006. In 2006, Paul Martin headed a Liberal government that was in power since 1993. As his party lost popularity and momentum, and got heckled for the sponsorship scandal, his ads became more negative and even went to the extreme of portraying Harper as the leader that would have soldiers walking on our streets. Meanwhile, Harper proposed a positive plan for change, tax cuts, and accountability. It would appear the very promises Harper made on accountability were broken and his ads are disintegrating in the same fashion. 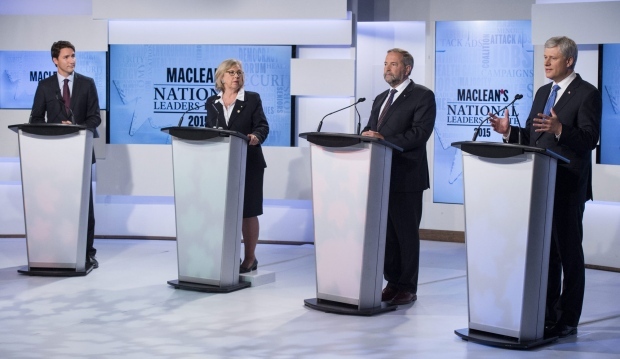 We can expect 2015 to contain the most negative ads Canadian politics has seen in a while. Essentially, if we modeled Paul Martin and Stephen Harper in a templated fashion and projected it to 2015, the roles would be reversed, Trudeau – in this sense – would become the new Harper. In this case, Thomas Mulcair and his NDP would become a wildcard because for the first time in its history it is getting very close to the political centre with a leader that has, to-date, come across as a person with a personality similar to Harper’s. But given what we expect to happen, Trudeau would be the man selling positive change while Harper desperately dangles onto his desperate attack ads (The reverse of Harper and Paul Marin in 2006). Harper’s supporters and columnists are also becoming desperate, you need not look further than columnist Daniel Dickin’s piece on how “Why Canada will become a dictatorship under Justin Trudeau” to see how convoluted some hard-core Conservative supporters are. Funny enough, it isn’t like Canadians couldn’t have known about Harper’s controlling demeanor and his very upward managerial structure and while all party’s have internal squabbles during nominations periods, picking on Trudeau’s in particular is wasting time on pointless issues considering the entire process inside the Liberal Party is democratic. “The Reform party is very much a leader-driven party. It’s much more a real party than Mr. Perot’s party – by the way, it existed before Mr. Perot’s party. But it’s very much leader-driven, very much organized as a personal political vehicle. Add to the list, how the Conservatives were built off a party which noted religion as its strength. Harper introduced the Reform Party’s first leader, Preston Manning, as a committed, evangelical Christian.” As the Conservatives try to defend the selective nature of accepting refugees in what has been claimed to have been based off religious preference, we cannot forget Harper’s own links to the Evangelical church which has undoubtedly influenced his decisions. 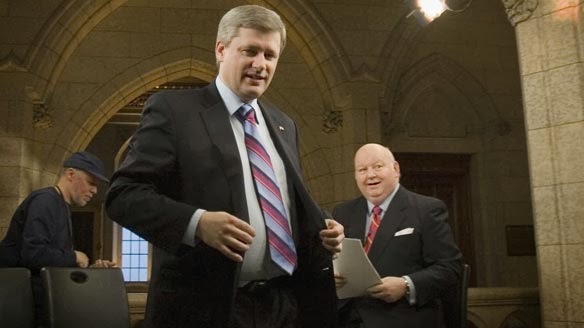 It would appear that 2015 may be a blast from the past and for those who are now realizing what the Conservatives look like, the most we can say is how good of a job Harper did hiding his 1997 self in 2006.